I have a confession to make. It’s not easy for me to say this, but the truth needs to come out. And while I wish there were alternatives, this is just the way things are, and I need to embrace it. I don’t like that I wear women’s socks. The men’s sock industry has forced my hand in this. I would love to wear men’s socks. I am a man after all. But it just doesn’t work. You see, I have small(ish) feet. Depending on the shoe I’m between a size 7 and a size 8. Fashionable socks don’t exist in my size. I’ve looked. Everywhere. And I refuse to pay $35 for a pair of socks…so don’t send my any of those links. The ONE SIZE FITS ALL label is a lie. If it were true I’d happily walk into the GAP and buy my socks from them. But I’ve tried that as well. Call me crazy, but I just don’t like the look where the heal of the sock is half way up my calf. The ONE SIZE FITS ALL mantra works for those men with a size 10-12…not for us MEN in the more petite range. Instead, I walk into the GAP and sheepishly make my way to the women’s socks. They actually have a nice array of choices. And they fit. Sure, I sometimes have to deal with a slight ruffle at the the top of my socks, but no one sees that. I hope. I’ve also just recently been informed, by my wife, that Target has a nice choice of women’s socks. Over the weekend I picked up five pairs for $15. No shame in that. The next time you see me ask me to lift up my trousers…I’ll gladly show you my girls socks. Or I’ll run crying to the bathroom…I haven’t decided yet. And to the men’s sock makers of the world — STOP IT! Give us small footed men socks that fit. Make them for us. We’ll buy them. I promise. Just stop trying to sell us the lie that one size fits all. You’re bruising our ego. And that’s good for no man…regardless of how big his feet are. This is a test post to see if a plugin is working. My son is seven. And I think he’s pretty cool. 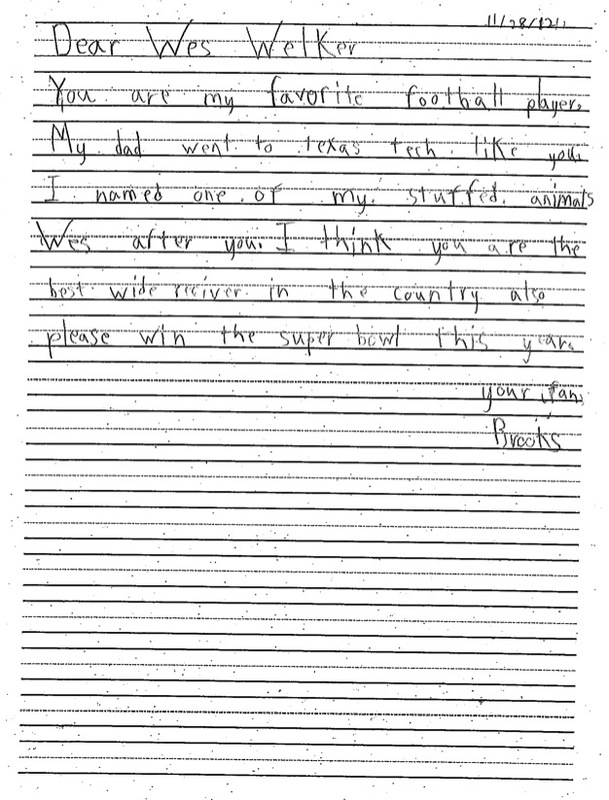 They had to pick a person to write a letter to in school. This is his letter. One of the things I was involved in as a teenager was being a puppeteer for my church’s children’s program on Sunday mornings. Granted, I wasn’t great (just a hint – you’re supposed to keep the top of your hand still, and only move your thumb when operating a puppet’s mouth), but I had fun and it was a way to help out the adults as they taught the children on Sunday. I’m 37 now and am playing with puppets once again – albeit a different type. A little backstory…I spent most of last fall looking for a new job after moving my family to Portland in August, 2011. During the process I had an interview with Puppet Labs for their Manager of Education & Training position. I did well during the interview process and the candidates were reduced to two – me and one other guy. Then something happened that I really wasn’t expecting. As a result of their process, Puppet Labs realized they needed someone at the Director level with more experience setting things up like Certification programs, and not just a manager. So, they chose not to hire either of us. But I was told I was liked and that they would keep my name and info in case anything came up in the future. I was disappointed as Puppet was really a place I wanted to work. A month or so later I landed a job at OCHIN as an Education Consultant. It was a good job and my Director there was easy to like, over the top enthusiastic, and had built a new team hiring two others at the same time as me to join an existing trainer already with the company. Within six months of me starting my two new team mates had resigned for other opportunities, and unrelated, my Director was told she was not a good fit for the company. So there I was, the last survivor of something that had just started six months prior. I knew it wasn’t going to be easy to stay there and had resolved to begin looking for a new job after returning from a trip to Japan I had scheduled at the end of May. One week prior to me leaving for Japan I received an email from Aimee at Puppet Labs asking if I “remembered” her – of course I did – and if I was still interested in working for Puppet – of course I was. She told me that they had found their Director of Education & Training, had hired a Certification Manager, and that they were looking for an Instructional Designer. I returned from Tokyo on Tuesday, May 29, had an interview with the Director on Friday, June 1, and had a job offer the next week. Needless to say, I was stoked. This was a huge answer to prayer and an incredible blessing. I’ve been at Puppet Labs for just a few weeks and the folks there are incredible. I am overwhelmed at how smart these people are. It’s a little intimidating, but they are all extremely helpful, from Luke – the CEO – on down. The timing of events and situations in life can be a thing of frustration or beauty, or both. It’s one of the great dichotomies. Things you expect to be easy turn out to be difficult. Things you expect to be difficult turn out to be easy. In this case I had conditioned myself to believe that the process of finding a new job was going to be difficult. Never – in a million years – did I expect to receive an email from Puppet Labs. And that’s beautiful. The search is over. The waiting has ended. And the celebration has begun. Julie and I knew back in February of this year that our time in Cardiff, Wales was coming to an end and that we needed to move back to the US. In March of this year I came to Portland to decide if this was the city for us. It was, and we started planning towards the big move. I started searching for a job in earnest in May — and it has finally culminated in a new job as an Education Consultant with Ochin. I start my new career on Monday, December 5th, and I couldn’t be more excited about it. Matt and I were talking and I was putting money in the parking meter. Very suddenly, without any forewarning, I pooped my pants. That is the truth. I think I remember Matt saying OK.